Journal of Clinical Pathology and Diagnosis is a peer-reviewed, open access publication that underlines the importance of clinical pathology in the early diagnosis health disorders towards prevention and cure. The journal thus caters to the interests of clinical practitioners, lab technicians, medical practitioners, pharmacists, academicians and students that are keen in exploring clinical pathology for innovative diagnostic discoveries. 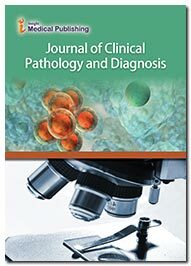 The study areas of the Journal of clinical pathology and diagnosis thus focuses on topics that highlights various aspects of the field, including histopathology, chemical pathology, cytopathology, dermatopathology, forensic pathology, haematology, microbiology, molecular pathology, neuropathology, virology, immunopathology. Chemical Pathology is a branch of Pathology which deals with the study of biochemical mechanisms of the body related to disease. Body fluids such as blood or urine are used for screening, diagnosis, prognosis and management through chemical and biochemical tests. Molecular genetic pathology is an emerging field of pathology which focuses in the study and diagnosis of disease through a variety of tests of molecules within organs, tissues or bodily fluids. To focus mainly on the sub-microscopic aspects of disease, molecular genetic pathology practices both anatomic pathology and clinical pathology, molecular biology, biochemistry, proteomics and genetics. Morbid Anatomy is concerned with the visible structural changes of diseased or injured organs and tissues. Morbid Anatomy also known as anatomical pathology is one of the two branches of pathology which diagnose the disease through analysis of diseased organs and tissues based on the macroscopic, microscopic, biochemical, immunologic and molecular examination. Most often pathologists combine clinical pathology and morbid pathology and the combination is called as general pathology. Ultrastructural Pathology is the detailed study of fine structural changes in body because of the disease. It uses the electron microscopic and immunohistochemical techniques, cell and tissue culturing, electron probe analysis and diagnostic EM methods. Pediatric pathology deals with the laboratory diagnosis of neoplastic and non-neoplastic diseases that impact the normal growth and development of children from the embryonic stage to adolescence. The developement of cytogenetics and molecular biology and their powerful tools for diagnosis has helped in the progress of Pediatric pathology area. Urologic pathology is the diagnosis of urologic diseases in relation with clinical pathology. Urologic diseases include bladder cancer, kidney stone diseases, prostate cancer, benign prostatic hyperplasia, prostate adenocarcinoma, and prostatitis. Proper biopsy and accurate diagnosis is important for treatment of the disease. Blood banking - Transfusion medicine is a subspeciality of clinical pathology which is concerned with transfusion of blood and blood components and deals with the issues of blood donation and other laboratory testings. Blood cells and blood products including fresh-frozen plasma and cryoprecipitate are administrated for pathological management. Comparative pathology is the comparison between the disease processes in human body with those of the animals. Neuropathology is the scientific study of diseases of nervous system tissue either by partial surgical biopsy or complete autopsy of body. Generally tissue from the brain or spinal cord is examined to aid in diagnosis of disease. A more recently developed neuropathology test named Epidermal nerve fiber density testing (ENFD) uses a punch skin biopsy to identify small fiber neuropathies by analyzing the nerve fibers of the skin. Oral and maxillofacial pathology deals with the study and diagnosis of the causes and effects of diseases affecting the oral and maxillofacial region. It is mainly related to the diseases of the mouth, jaws and related structures such as salivary glands, temporomandibular joints, facial muscles and perioral skin.For microscopic evaluation, pathologists observe microscopically by conducting biopsy.